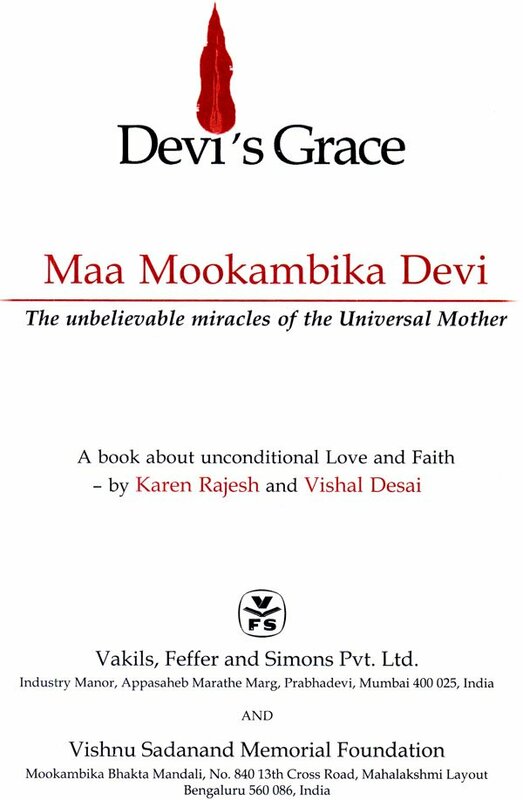 Devi’s Grace is a book about the entry of Maa Mookambika Devi into Swamiji (Late Shri Vishnu Sadanad Nayak) life and his remarkable metamorphosis from family man to swami. Although swamiji was known (to His devotees) as a reluctant Swami his love and belief in Devi was unquestionable. Devi tested this faith and made him undergo personal struggle and sacrifice but she never let go of Her patri hand swamiji was rightfully anointed by Maa Mookambika Devi to help spread her divine grace to mankind. Even today his powerful presence and amazing kindness continue to spread miracles. Carrying on his late father (swamiji) divine legacy of spreading Maa Mookambika Devi word Guruji (Shri Satyendra V. Nayak) is dedicated to his calling. Devimaa chose her second patri when he was just a young man. Eager to lead a simple family life Guruji had no idea of the great plans Devi had in store for him. She bestowed her power and loving grace on him testing him just as she had his father before him. As Devi messenger Guruji has offered his heart mind and soul to the gigantic task of spreading her ever constant love and miracle to devotees across the globe. As a new entrant to the vast family of MaaMookambika Devi and her Patri Shri Satyendra V. Nayak, Karen Rajesh cannot but amaze at her wonderful fate to have been blessed by Devi to Spread her word. As professional working for one of India largest media house Karen feels very fortunate to manage the fine balance between work and family and her heart very own obsession: Maa Mookambika Devi! A finance professional with a reputed MNC in Mumbai, Vishal divides his time between performing Devi Various sewas and his family. 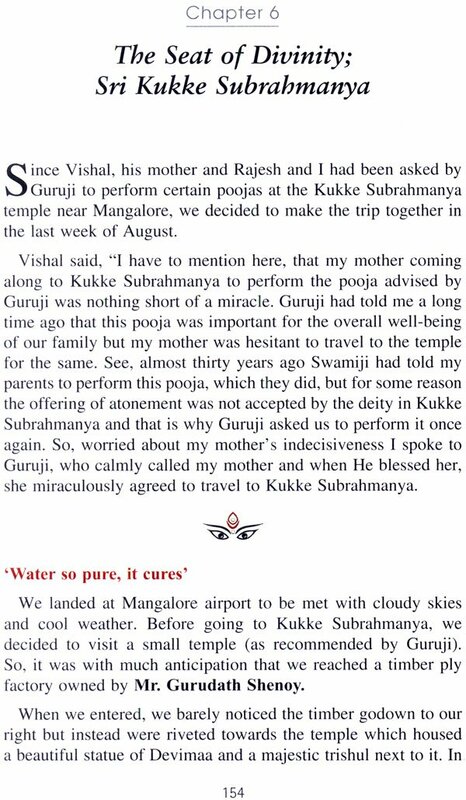 As a devotee who has known Swamiji since childhood and later his son; Guruji Vishal Desai feels extremely honored to have been chosen to carry out what he calls a divine task. This book is a compilation of the first-hand account of the various devotees of Maa Mookambika Devi and her Patris (divine messengers); Swamiji (late shri Vishnu Sadanad Nayak) and Guruji (shri Satyendra V. Nayak). Interpersed with these heart rendering and soulful admissions are the simple and profound truth about the power and presence of the universal mother extolled by late swamiji and his son Guruji. As writers our attempt is to take you along with us on our amazing journey across cities and religious event to meet men women and children whose lives have been irrevocably transformed with the Blessings and Grace of Mookambika Devi and her patris. We all need the Presence of a guru to lead us toward the path of the Great Divine thus moving onto something greater than imaginable. This book is a testimony to the expression when you have found water in a desert full of thirsty people you must shout there is water here. We hope that you will (like so many before you) find yourself on the path that leads towards the temple of Maa Mookambika Devi. This book will show you with much clarity and conviction that all you need is implicit faith and immeasurable love. When you experience a life defining moment it is as if be the same again. In the last week of may 2010 I came to realize through an extraordinary gentleman by the name of Shri Satyendra V. Nayak that my creator is none other than the Divine mother. Everything else in my life before that moment of realization seemed irrelevant and inconsequential and it felt like I was witnessing a new dawn. My world (I am happy to say) is now dominated by her indescribably wonderful presence can it makes every day seem like a beautiful one. My name is Karen Rajesh and I was born and bred in Mumbai India. I’m woman of Christian faith married to Hindu. Although I fervently believe in the all embracing magic of mother mary (and have always been more attracted to the female form of the divine), I questioned at a young age the paradox of following rituals but not practicing the ideals of a religion. I sought hard to break free of these shackles but it is only today that I can say that I have finally found the right path and am following what my heart always knew but could not identify through the chaos. I believe it was my curiosity about spirituality that brought me in touch with the universal mother. So powerful was she that everything else paled in comparison. I knew then that life would never be the same for it was only a DEVI whom I could bow down and surrender to. This mother is kind but strict loving and also reprimanding. She fulfills all her devotees desires only asking one thing in return; FAITH! She is known and worshipped as MAA MOOKAMBIKA DEVI. When goddess saraswati, Goddess Lakshmi and Goddess Kali merged with Lord Brahma Lord Vishnu and Lord Mahesh the ultimate Manifestation was Maa Mookambika Devi. According to legend when kola maharshi was meditating he was disturbed by a demon called mookasura. The demon was also engaged in doing penance to please Lord Shiva in order to get a boon form him. To prevent he demon from getting his evil desire fulfilled Adi Shakti made him mooka (dumb) so that when Lord Shiva appeared before him he could not ask for anything. 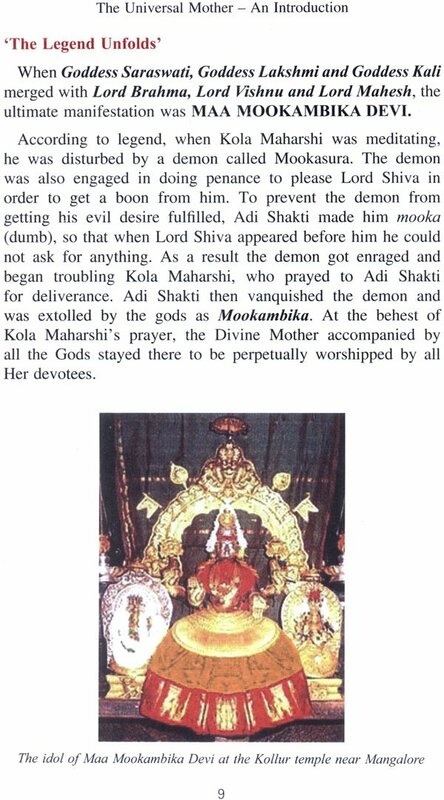 As a result the demon got enraged and began troubling Kola Maharshi who prayed to adi shakti for deliverance. Adi Shakti the vansqished the demon and was extolled by the gods of Mookambika. At the behest of Kola Maharshi prayer the Divine mother accompanied by all the gods stayed there to be perpetually worshiped by all her devotees. Maa Mookambika Devi is regarded y all her devotees as the universal mother and Adi Shakti (the source of all energy) the temple of Kollur dedicated to Mookambika Devi is one of the most prominent shrines in the state of Kanataka and Keralla India. Located on the banks of the river sauparnika and the lush green Kodachadri Hill the temple attracts million of pilgrimage every years. The deity is in the form of a Jyoti Linga incorporating both Shiva and Shakti. 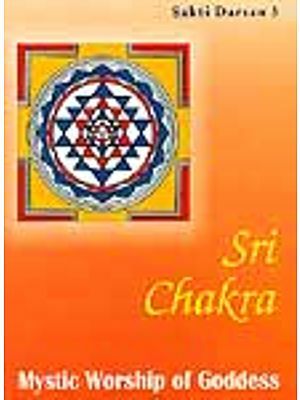 The punchaloha (five elements mixed metal) image of the Goddess on Shree Chakra is stated to have been consecrated by Adid Shankaracharya some 1200 years ago. It is believed that when Adi Shankara meditated at Kodachadri hills Mookambita Devi appeared before him and asked him for his wish. He revealed that he wanted to incorporated Devi to a place in Kerala to worship her. Devi agreed saying that she would follw Adi Shankara only on the condition that he should not turn and look back until he reaches his destination. To test him Devi deliberately paused and when Adi shankara could not hear her anklets he suddenly turned around. Devi stopped following him at once and asked shankara to install her vigraha exactly the way he saw her. The place where mookambika Devi Stoped is Kollur. The major importance of the Kollur Mookambika temple is that the Goddess is worshipped here in the Swayambhu Linga form there is a golden line in the Linga and it is wider on the left side and also taller. It is believed that Goddess saraswati Goddess Lakshmi and Goddess Kali reside in the left side and Lord Brahama Lard Vishnu and Lord Mahesh reside in the right side. Although it was just a few days since we had come back from our trip to the Maa Mookambika Devi’s temple in Bangaluru I was consumed with thoughts bordering on obsession of Devimaa during most of my waking hours. When I slept it was dreamless as though even my subconscious mind was too exhausted to work up any more thoughts. I could not shake off the feeling of sadness that I never got the chance to meet the legend called Swamiji. His presence was so powerfully that his life create and indelible impression on the line of all his devotees. It was this look of belonging in their eyes that was the cause of my already aching heart to long for a guru just like him to enrich my life. To me it seemed like some cruel twist of faith; that I had traversed to great distance to find myself at the temple of Maa Mookambika Devi but was unable to enter since there was no one to open the doors. 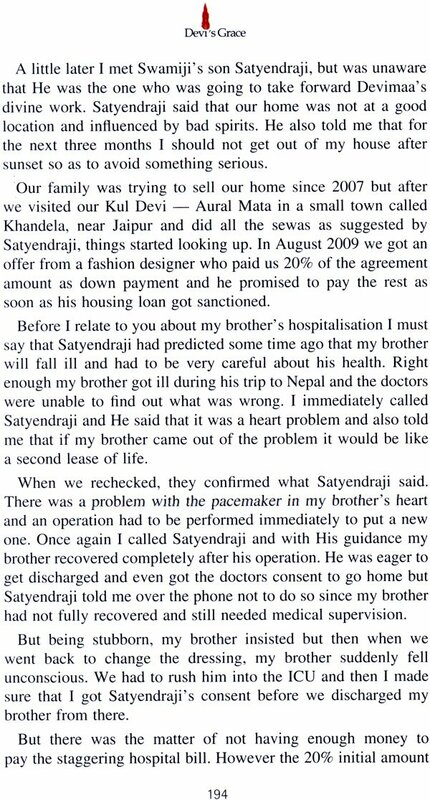 So you can well imagine my surprised when one night in June dreamt about Satyendraji. It as cloudy hazy stormy as the night outside my window and yet I remember each details with amazing clarity. In the dream Satyendraji laid his hand on my head as if to bless me and the second he did so I felt an overwhelmingly powerful presence trying to enter my body. This entity was a bright light and it was huge and getting bigger by the second. Afraid yet excited and curious I trembled in my sleep and was roused from the dream with a start. Although I sat up in bed shaking uncontrollably; unsure about what I had experienced. I was certain it was not something out of the ordinary and to be taken lightly. I knew deep down at the very core of my being that something important and cataclysmic had taken place and my life would never be the same. The next morning I told my husband Rajesh about it and he took was perplexed and unable to offer an explanation. So I went back to my usual schedule a bit unsettled but yet waiting for something to happen then when I was dozing off in the train on the way back home it suddenly hit me like a ton of bricks. The huge bright light in my dream that tried to enter my body when Satyendraji blessed me was none other then Devimaa! The entity had such FORCE and POWER that I could only associate it with HER presence. 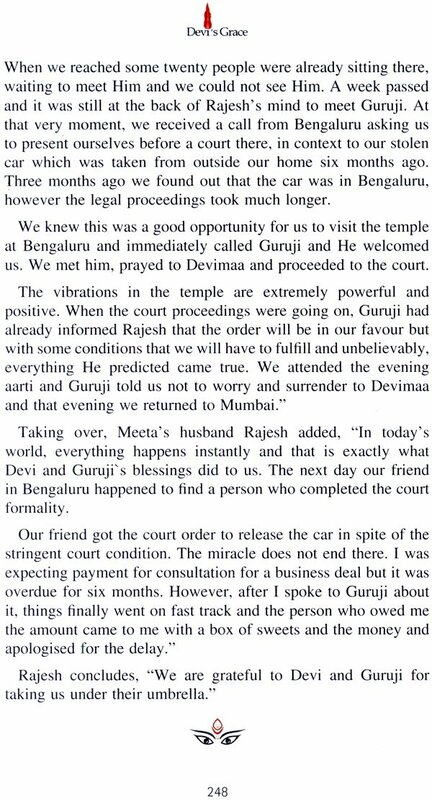 Then it struck me harder that devi had come through Satyendraji who I realized with finality was NOT ONLY to be my GURU but also the rightful heir to carry on her divine work! My life defining moment had indeed turned my world on its axis and by none other than the universal Mother; Maa Mookambika Devi. I shed tears of joy and happiness that she had answered my prayer and could not to talk satyendraji about it. Here, I must bring to light the fact that all my life I have never believed that a mere human being can be given the status of a GURU or a GOD. Therefore I could never bring myself to bowing before one. But after that wonderful dream when realization dawned and I could see the writing on the wall those immature misconceptions were blown away and suddenly life took on a new meaning. I called Bela to ask her when Satyendraji would be in Mumbai next and then related my amazing dream to her and conveyed my feeling on the same. She was wonderful about the whole thing saying encouragingly now you know why we did not reply when you asked us who Devi next patri will be you see we have discovered it for ourselves and now you have too. You must consider yourself very lucky indeed to have found a guru in this lifetime. My cup seemed to have runneth over and I just could not stop thinking about the amazing experience of my dream. 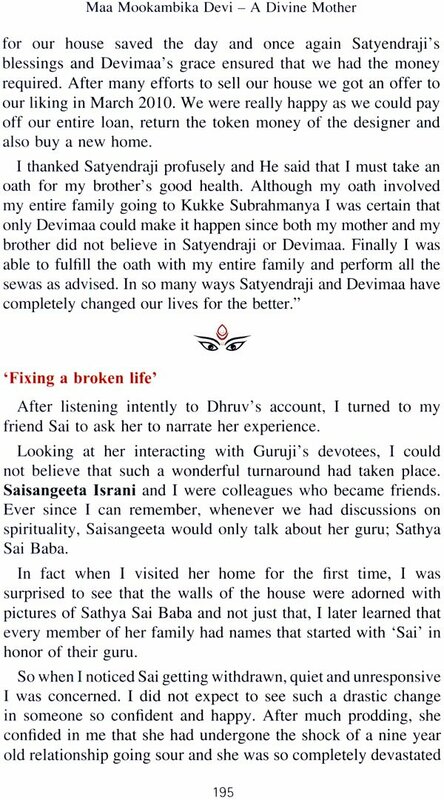 I even penned a small note on how I felt with the sudden appearance of Devimaa in my life and Satyendraji as my Guru. Then one fine Sunday evening in early July, Rajesh and I met Satyendraji. What waiting for him I fondly recollected how I felt the first time I saw satyendraji in May 2010. I was expecting a stern and serious pot bellied old man with three lines of holy ash smeared across the forehead. But he was the complete opposite. Tall with a head full of jet black hair and a disarming smile Satyendraji was the very picture of a contemporary man whose humility sense of humor and amicability shone through. I was shaken out of my reveries when satyendraji came out to meet us. He spoke to us in his deep and reassuring voice in front of the little temple that housed Mookambika Devi and when he touched my forced to bless me I felt something stir at the very core of my being! I wanted to cry with joy for SHE was BLESSING ME in the presence of the man who was to be my GURU! That evening Satyendraji gave Rajesh and myself a blessed limbo to protect us he told me that my ancestors were from the Devi kutumb (family) and that is why I had come back to worship her. No wards uttered could have brought me more Joy! Later when we were all seated with the other devotees I said to Satyendraj “I have something very important I want to share with you. He listened attentively as I related my dream of Devimaa and him. 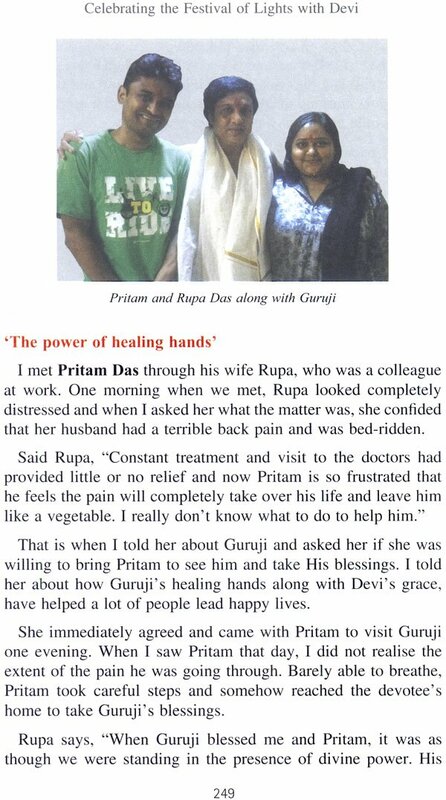 At the end when I told Him that whilst at the Bengaluru her for a Guru he smiled and said my Devimaa is a wonderful mother she does not let down any of her devotees. You see Karen you may have been born and raised as a Christian but you have been (in all your previous lives) and will always be part of Devi Kutumb (family) and that is why she has brought you back to where you belong. I am pleased and humbled that you consider me as your Guru. I have only one purpose on this earth and that is to serve Devimaa and keep all her devotees happy. Happy to hear his kind word I said “ I have written something for you Guruji, (I was surprised to find how easily I had stated addressing him a Guruji) because I wanted to capture all that I feel. I would mean a lot to me could spare a few minutes to go through it. 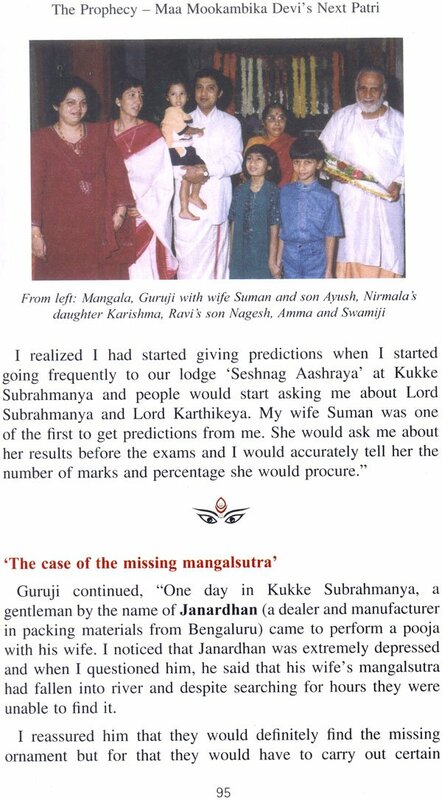 Guruji quality read and when he finished he smiled happily at me and said it is very well written Karen, I think devimaa has sent you to me to write her book. Nodding his approval Guuji said. Vishal Desai will be most happy to help you put this book together and I would like you to work along with him. Enthralled with the wonderful experiences related by Guruji to his rapt audience. I felt extremely lucky to get Guru undivided attention. His eyes lit up every time he talked about Devi and her countless bounty of gifts that she reserved for all her staunch believes. Much later I said to the entire group present that while we were listening to endless stories of Devi miracles I had not experienced one yet. But then I realized that was untrue. The fact that after almost a year of looking for spiritual direction I finally found my Guru was in itself a miracle. For me everything after that was just acceptance of Devi’s will.